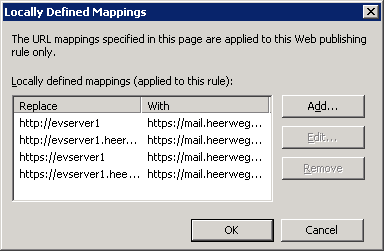 Create a new webpublishing rule using the "New Web Publishing Rule Wizard"
Name the rule "Enterprise Vault for Outlook Anywhere"
Select the "Publish a single web site or load balancer" option and click Next. In the "Internal site name" field, type the Enterprise Vault server name that internal clients use to access Enterprise Vault and click Next. In the "Accept requests for:" field, choose This domain name (type below). For the public name, type in the external host name that outside users use to access Outlook Anywhere and click Next. On the next screen, select the web listener used for Outlook Anywhere. For the authentication delegation screen, choose NTLM authentication and click Next. Leave the default setting for the user sets screen. The default should be "All Authenticated Users". Click Next and then Finish.